Server cabinets and enclosures are available to house various sizes of computer servers. 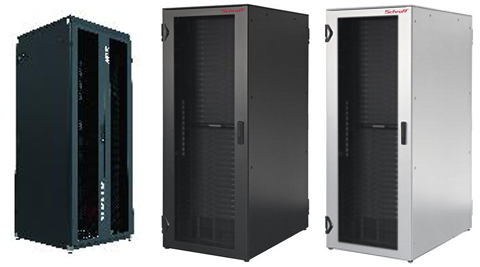 They are basically enclosed 19”equipment racks with additional specialized hardware installed. Server cabinets come with can be vented doors at the front and rear, with side panels that can be removed. Top sections can be solid or vented and fan mounted. The vertical mounting hole spacing on the racks inside the cabinets is as per the EIA 310D standard. The cabinets also come with bonding jumpers.Additional rack grounding busbars can be ordered as accessories. Though the cabinets are typically available in dark grey (RAL 7021) or light grey (RAL 7035) colors, the cabinets can be ordered with any of over twenty different colors.